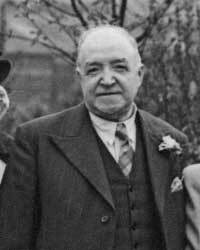 Henry Albert Newns was the second son of William, a methodist minister, and Louisa and was born in Basset Street, Cambourne, Cornwall on 8 December 1881. In 1901 Henry was a grocer's assistant boarding with grocer Ernest Barnett at 26 Park Avenue, Oswestry, Shropshire. This portrait is from a group photograph taken at his son Eric's wedding in 1946. Mary Ellen Scott, illegitimate daughter of Ellen Scott, was born in Bury on 26 December 1883, and was adopted by George and Sarah Pearson who lived in Urmston, Lancashire. In 1901 she was a servant in Urmston and recorded as Nellie Pearson. Electoral Rolls show that 16 Augusta Street was the home of William George Newns, Henry's elder brother. Mary died of cancer of the gall bladder and liver on 1 February 1946, following which Henry went to stay with his sister Louisa for a while. Administration of Mary’s estate, valued at £282 19s 8d, was granted to Henry. Henry then met Florence Ilsley, a 54-year-old spinster from Anfield, and they were married at Norris Green Mission on 11 August 1948. Henry died of colon cancer in Walton Hospital on 17 November 1949 aged 68. Florence Ilsley/Newns married again in 1956 to John Tauson. He died in 1963, aged 79, and a street directory of Liverpool shows that in 1966 she was still living at 53 Zig Zag Road. Florence died in 1980, aged about 86. Eric, as George was later known, became a teacher and married Belinda Parry in 1946. Dora attended Blackburn House Grammar School from September 1933 (her fees were paid for by her brother who had newly qualified as a teacher). Following matriculation Dora left school to work in the offices of Liverpool Tramways. When Eric returned to England at the end of the war Dora had gone to live in London. The photograph was taken at Eric's wedding in 1946. She became a teacher and in 1951 was living at 65 Granville Road NW6. She married David Lloyd Jones (of 63 Albert Bridge Road SW11) on 24 March 1951. They are not known to have had any children. 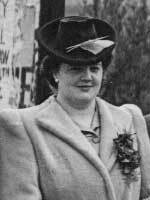 Dora Jones, widow of Crawley, Sussex, died on 25th December 1988. In her will she left her house in Crawley to two cousins, Terry and Nigel Jones, with bequests to their wives and children. There were also bequests to the Methodist Homes for the Aged, the Musicians Benevolent Fund, the Multiple Sclerosis Society and the Royal Society for the Prevention of Cruelty to Animals. The remainder of her estate went to Terry Jones.